PUREhappiness: PUREhappiness meal planning worksheets! as promised (although a little overdue) i'm publishing my meal planning worksheets as a free download for you today! this is a worksheet that i've developed over many months of meal planning. 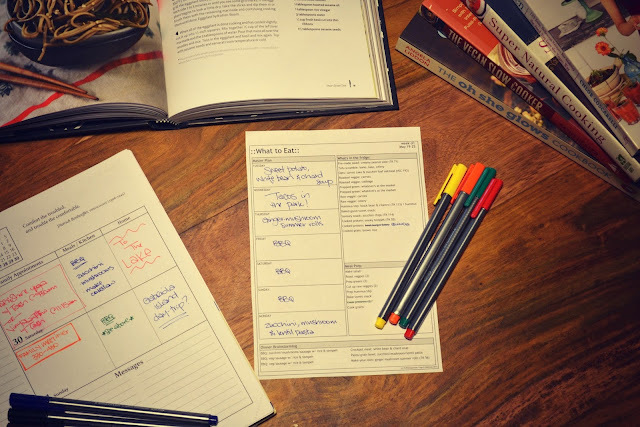 it works because it's specific to what i need, so i've included my full template, and also a more bare-bones template that you can customize to your own meal planning needs. i'm all about highlighting certain veggies each week (especially because at the farmer's market you usually buy a basket or bunch of something, like a basket of potatoes or a bunch of carrots, rather than one single potato or carrot, and i hate being stuck with a bunch of veggies that just sit in my cupboard because i only had one recipe planned that called for a radish) so i will often plan several meals around the same ingredient. for example, last week i knew i was in the mood for sweet potatoes, so i planned my salad to be a new & sweet potato salad, one of my roast veggies to be sweets, and my crockpot meal to be sweet potato and white bean soup. although sweet potatoes aren't the best example because they last forever (they are just my favourite veggie! ), this works really well when an ingredient is something that isn't going to last more than a week in your fridge, so if you don't use up the whole basket or bunch, they'll go to waste (and i'm terrible at acknowledging this and freezing the extras before they actually go bad). 1) i have an overall "master plan" section on the left. this is the final part that i fill in, and on a normal week this simply states which dinners are planned for which days. sometimes i will also use this as a weekly planner, since i put it up on the fridge, so i will include notes like "paul works late" or "grocery shop today" that are going to affect what/how we eat that day in this section for my reference. if i'm really on the ball, i might even outline breakfasts and lunches in this section (because then i can decide beforehand which morning i'll make a big batch of oats, and which morning or lunchtime i'll make a tofu scramble - both of which last in the fridge for a few days). 2) the "what's in the fridge" section lists everything that i've got (or plan to have) in the fridge that can be combined to make various yummy veg & grain bowls (good for breakfast, lunch, or dinner!) ...this helps to mitigate the complaint "there's nothing to eat in our house!" and because of my "meal prep" section below, i already know what types of foods i need to prep each week in order to feel like i've got what i need to easily throw together meals. this is where i get specific with my meal prep, and plan which greens i'll buy this week (or i'll fill it in after my farmer's market shop), which grains i'll prep, etc. 3) the "meal prep" section is the list of things that i try to prep each week to feel like i've got everything i need to throw quick meals together. this list of general items to prepare doesn't change much each week, and it is mostly items that are used for breakfasts, lunches, and snacks. i like to have veggies, grains, proteins prepped and ready to go because then i can just throw them together into a bowl and voila, instant lunch! super easy to do, even on the whiniest toddler days :) this list gives me the ability to plan when i'm going to prep each item (usually i jot down the initial of the day of the week when i want to have things done by, as i sometimes have to grab an hour here and there over the course of a few days to get all my meal prep done) and then i can cross them off this list once i've got that item prepped. 4) the "dinner brainstorming" section is where i plan abstractly what our dinners will be for the week. this is the part that changes the most week to week, as i enjoy trying out new recipes. however, since we are so busy at home and we are on a tight grocery budget, i decided i needed to cut down on the new recipe trying (because new recipes take time and usually a lot of new ingredients, which sends my grocery bill through the roof). so in the full template, i've got a dinner outline written in: for the summer, we decided to plan three nights per week to barbeque, one crock pot meal (i've got a great vegan crock pot cookbook) for the days that i go to an evening yoga class and don't have any prep time before dinner, a fun night (make-your-own, which is usually tacos or pizza), and a pasta/grain bowl (which utilizes the prepped foods that i've already got in the fridge). i usually leave one night unplanned, because there's always going to be one night where i just don't feel like cooking (or something comes up like a dinner out with friends, or we've got leftovers to use up) and i would rather fly by the seat of my pants for one night than have food in the fridge go to waste because one of my planned meals doesn't get made. i've provided several versions of the meal planner: there's a full template version, which is the exact one i use (with all the specific meal prep i do, as well as the types of dinners we eat each week) and you just have to fill in the blanks. more likely though, you'll want to use the bare bones version which doesn't have anything pre-filled in for you, so you can customize it to what you want. if you're interested in having a custom version made up for you, send me an email and we can discuss the details! when you print the worksheet, you can do so either as a full page, or you can print two to a page and cut the page in half (which saves paper, and doesn't take up as much room on your fridge if you choose to post your meal plan). you can also print it half sized on the page but leave the other half blank, and then use that other half to write your grocery list. so there you go! let me know what you think of the meal plan worksheet, and if you use it! i hope you find it helpful. i certainly feel that when i've taken the time to plan and prep my food for the week, i feel much more intentional and well-fueled, and that carries over into the other areas of my life!